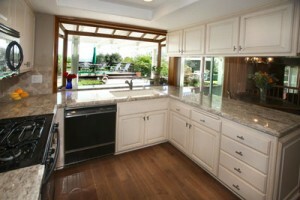 Remodeling your entire kitchen may give it a new look, but it also can be costly and laborious. Choosing to reface your kitchen cabinets, on the other hand, can provide the same elegant look to your kitchen at just a mere fraction of the money and time. Let’s face it, cabinets take up the majority of your kitchen wall space and are what make your kitchen yours. Unfortunately, when your cabinets are outdated, it resonates throughout your entire kitchen. The good news is, cabinet refacing can turn an outdated kitchen into a delightful, functional space where you’ll look forward to spending time with family and friends. Don’t trust anyone to reface your cabinets, though. Allow Vianvi Signature® Cabinet Refacing, a leader in the industry, to reface your kitchen cabinets, and give your kitchen new life once again. With more than 3,000 possible combinations of cabinet door styles, wood species, thermofoil colors, stains, glazes, and hardware designs to choose from when we reface your cabinets, Vianvi Signature® Cabinet Refacing is the clear choice. Whether you’re interested in kitchen refacing, or you want us to reface cabinets in your bathrooms or any other area of your home, we take the utmost pride in all that we do, and we are sure that you will love the end result. What you might find even more amazing than the look and functionality of your newly refaced cabinets, and the affordable price tag attached, is the time it takes to complete a project. In fact, a team of our certified installers can reface cabinets in as little as (3) days. If you would like us to reface your cabinets and transform your kitchen into the one that now only exists in your dreams, or if you’d just like to learn more about what cabinet refacing is and how it works, contact your nearest Vianvi Signature® Cabinet Refacing dealer today. If you are a home improvement contractor who is interested in becoming a Vianvi Signature® Cabinet Refacing dealer, contact us for more information.